From the company that brought last year’s “Pick of the Fringe” 13, comes Smile, a musical and satirical take on teenage beauty pageants. Awkward Stage Productions adds a new twist to this oft-forgotten 80s musical by using puppets to portray all of the adult characters alongside the human youth cast. The crew and musicians are youths too. Stephanie Johannesen, Chelsea Powrie, Brenda, Erin Palm, and Jorgette Jorge in Awkward Stage's production of Smile. Music by Marvin Hamlisch (A Chorus Line) and book and lyrics by Howard Ashman (Little Shop of Horrors). Directed by Cara Tench, Corwin Ferguson, and Andy Toth. Choreography by Cara Tench and musical direction by Andy Toth. Starring Julia DiSpirito, Rachael Harrison, Taylor Scott, Maiah Fujino, Katie Allinger, Brittany Gee-Moore, Jessica Wong, Paige Wise, Hailey Perkins, Isabella Halliday, Fanco Celli, Devon MacKinlay, Kai Bradbury, Kaitlyn Yott, Morgan Roff, Patrick Arnott, Jonathan Hers, Erin Palm, Chelsea Powrie, Stephanie Johannesen, Chelsey Yamasaki, Ashley Siddals, Jennifer Suttis, Lindsay Corbett, Erika Babbins, Rebecca Friessen, Brittany Scott, Neil Aspinall, Zach Wolfman, Myles McCarthy, Michelle Baynton, and Jan van Vianen. Awkward Stage Productions presents Smile from September 8 – 18, 2011 at at the Firehall Arts Centre, 280 East Cordova Street, Vancouver. Tickets are available online or by phone at 604-637-6380. Touchstone Theatre celebrates its 35th season with a lineup of original Canadian musicals and music theatre. First up, is Mimi (Or A Poisoner’s Comedy). Mimi, which debuted to good reviews in Toronto last season, is billed as a comedy about a young French aristocrat who takes up poison as a hobby. Jennifer Lines in Mimi (Or A Poisoner's Comedy). Photo by Emily Cooper. Lyrics and music by Allen Cole, book and lyrics by Melody A. Johnson and Rick Roberts. Directed by Katrina Dunn, musical direction by Steven Greenfield. Set design by David Roberts, costumes by Farnaz Khaki-Sadigh, lighting by Gillian Wolpert. Starring Donald Adams, Greg Armstrong-Morris, Peter Jorgensen, Jennifer Lines, Linda Quibell, and Sanders Whiting. Mimi (Or A Poisoner’s Comedy), presented by Touchstone Theatre, runs until November 20, 2010, at the Firehall Arts Centre, 280 East Cordova Street, Vancouver. Tickets are available online or by phone at 604-689-0926. Evan Goldman is looking forward to turning 13 and his Bar Mitzvah when his parents divorce and his mother abruptly moves him from New York City to small-town Indiana. Evan’s subsequent quest for popularity is the basic premise of the coming-of-age musical 13. While 13 only lasted a few months on Broadway in late 2008, the cast recording has become a favourite on my playlist. 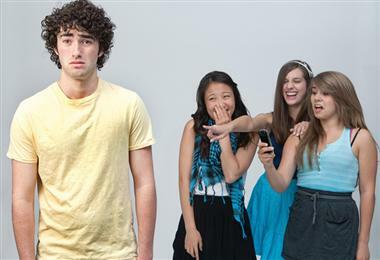 Boasting a teenage cast, band and technical crew, 13 makes its Vancouver premiere as part of the 2010 Vancouver International Fringe Festival and is the debut production from Awkward Stage Productions Society. Awkward Stage’s mission is to “provide real life performance and production opportunities to youth in that awkward stage of transitioning to professional theatre.” The show has also been double-cast with a senior and junior ensemble alternating performances. Book by Dan Elish and Robert Horn, with music and lyrics by Jason Robert Brown (Parade, The Last Five Years). Directed by Cara Tench and Corwin Ferguson, with musical direction by Andy Toth. Starring Zach Wolfman, Alex Lara, Kristin Bunyan, Alyssa Baker, Quinn Cartwright, Ashlee Kim, Jonathan Hers, Morgan Roff, David Cohen, Dylan Sloane, Fiona McIntyre, Julia Di Spirito, Devon MacKinlay, Eric Dunnill, Jacob Wolstencraft, Yoav Lai, Kai Bradbury, Anna Sutela, Ginny Dunnill, Caitlin Carhoun, Julie Cooper, Katie Coopersmith, Brittany Gee and Maiah Fujino. Awkward Stage Productions presents 13 from September 9 – 19, 2010 at the Firehall Arts Centre, 280 East Cordova Street, Vancouver. Tickets are available online. Debt is directed by Donna Spencer, features choreography from Tara Cheyenne Friedenberg, and stars Ellen Kennedy, Tom Pickett, Tracey Power, Andy Toth and Simon Webb. 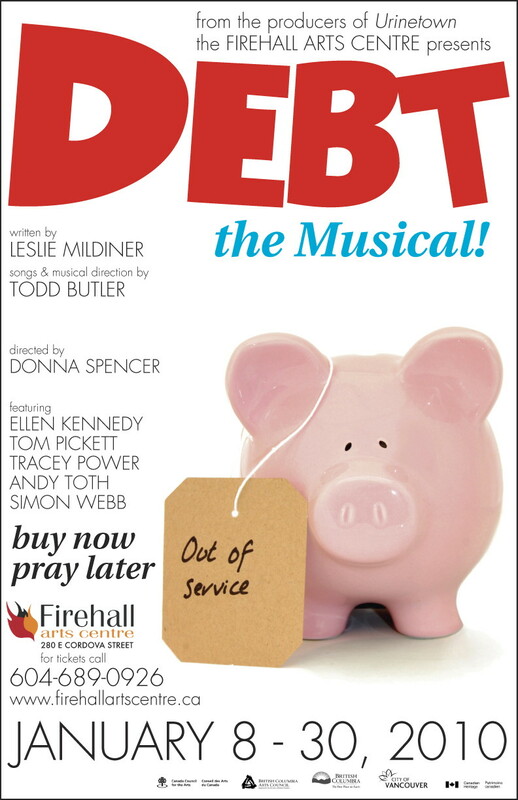 The Firehall Arts Centre presents Debt- the Musical with preview performances from January 8 – 12, and opening Wednesday, January 13 – 30, 2010. Tickets are available online or by calling 604-689-0926.